On February 25, internationally marathon was held, which had about 36,000 runners from home and abroad, while the PyeongChang Winter Olympic Games, which was the most successful one ever for Japan, held its closing ceremony. As marathon was designated to select the runners who will join the 2020 Tokyo Olympic Games, it received close attention. On that day, the weather, temperature, and wind conditions were perfect for a marathon. A new record was set for the fastest Japanese runner for the first time in 16 years, making this marathon a memorable one for Japan. About a hundred runners from overseas, who participated in the 2018 marathon, achieved completion of all the AbbottWMM* marathons. About 1,000 overseas runners and parties, including the above runners, arrived at Happo-en from 5:30 pm through 7:00 pm. Even 38 buses arrived one after the other. Each corner was crowded and well-liked by the attendees. Everyone simply enjoyed it and we couldn’t believe that they finished a full marathon just a few hours before. A highlight of the party was an awards ceremony for the athletes who achieved completion of all the AbbottWMM marathons. All the people at the party got into the spirit and were impressed by the power of sports that unified everyone’s hearts in the ceremony. Happo-en was really happy to host the party. In Japan, we are going to have many international sporting events in 2019 and 2020. 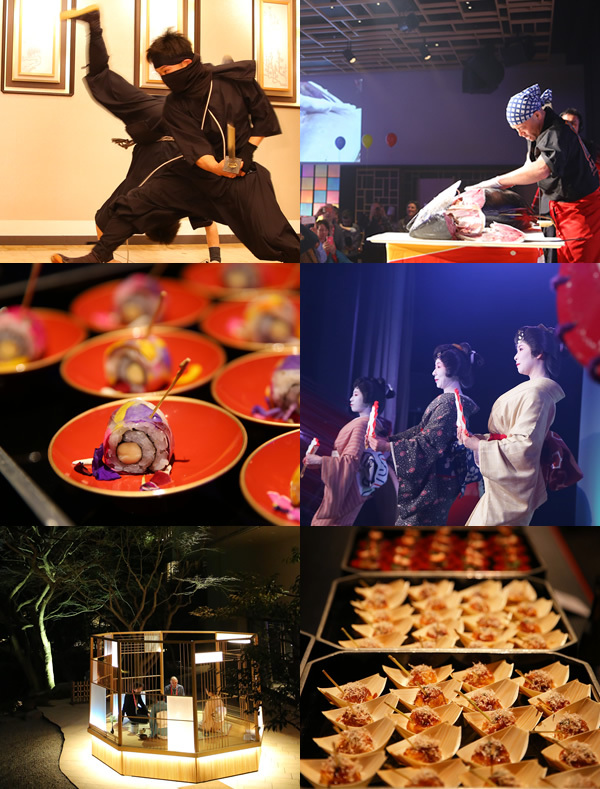 Happo-en will improve our event-producing skills and create unique and thrilling events, in which overseas guests can experience both traditional and current Japanese culture. Please do not hesitate to ask us anything about sporting events and business events when you plan them. Happo-en will be happy to help you to create a unique and special one.